Beta launch of the Online course "Urban Metabolism for Policy Makers"
We're very excited to share with you that the beta version pf the first online course on "Urban Metabolism for Policy Makers" is out. 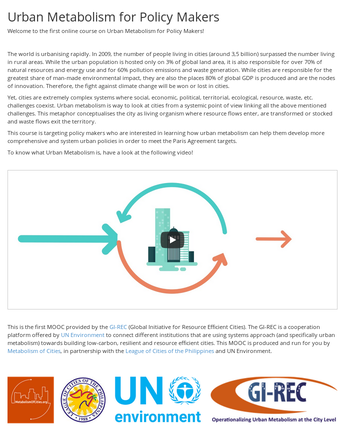 This is a collaboration between Metabolism of Cities, UN Environment and the League of Cities of the Philippines in the framework of the GI-REC (Global Initiative for Resource Efficient Cities). Come have a look and please let us know what you think (all feedback is very welcome!! ).